Concerned with supplying cinematograph equipment almost from the beginning of the industry Hughes was the successor of William Parberry Hughes, chemist and druggist, of 151 Hoxton Street, London. Before becoming a manufacturing optician W.C. Hughes had entertained on the stage, receiving high praise for his dramatic readings, humorous songs and performances of magic and mystery. From 1879 to 1882 Hughes traded in optical equipment and magic lanterns from Hoxton Street, but in 1883 moved to Brewster House, 82 Mortimer Road, off the Kingsland Road. The following year he patented an improved Choreutoscope, a special mechanical lantern slide - previously manufactured by Beale of Greenwich - for producing on the screen dancing skeletons and simiar effects, and based on an intermittent mechanism related to the Maltese cross that would later be used in many film machines. Early in 1897 he started to sell equipment designed by Prestwich - the Moto-Photoscope projector and Moto-Photograph camera - and eventually designed and produced his own cameras, projectors, and accessories. One novel projector used a piston mechanism. A huge 'Street Cinematograph' peep-show based on the Photo-Rotoscope projector and with viewing apertures for sixteen spectators or more was apparently popular. 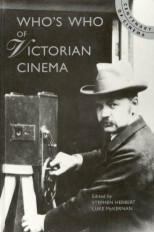 Hughes was responsible for two films of Queen Victoria's 1897 Diamond Jubilee Procession, and in 1898 a series of articles in the Optical Magic Lantern Journal entitled 'A Little Information About the Cinematograph'. His business survived into the present century, by which time he had earned himself an honourable place among the pioneers of the British film industry. He died on 7 August 1908, aged sixty-four.